STRATFORD, CONNECTICUT, August 17, 2018 - CTI Electronics Corporation is excited to announce ISO 9001:2015 certification which is a revalidation of an established 30 year Quality Management System that incorporates the best of the best practices. CTI's advanced stage gate processes incorporate the commercial ISO-9000, as well as conforming to military MIL-I-45208 and medical IEC 60601-1 to provide customers with a consistent high quality product. The TUV Rheinland and CONNSTEP auditors were impressed with the CTI Quality Management System. CTI is a manufacturer of rugged NEMA 4 (IP66) industrial computer peripheral devices using a modular design methodology. This allows CTI to remain very competitive even at a low volume production yet a high product mix ratio of 10s, sometimes 100s of combinations. The manufacturing process quickly builds complex sub-assemblies into hundreds or even thousands of Commercial-Off-The-Shelf (COTS) finished product, typically within one to two weeks. Custom tailored products can typically be rapidly prototyped, meeting both cost and time to market constraints. CTI Electronics Corporation is dedicated to the design of its own sensor technology and manufacture of NEMA 4 (IP66) watertight HMI devices for harsh environments and/or when reliability is critical�. Devices include Keyboards, Trackballs, Joysticks, and Intelligent Switches in offerings for Original Equipment Manufacturers (OEMs), Systems Integrators, and Commercial End Users. CTI is worldwide known for interfacing people and machines� in extreme operating temperatures ranges (-40�C to +80�C) or under exposure to harsh chemicals, oils, or bio-hazardous agents. For additional information, visit www.ctielectronics.com or call 203-386-9779. When reliability is critical call (203) 386-9779, or visit us at www.ctielectronics.com . 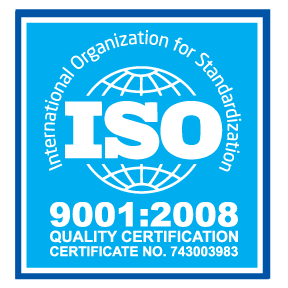 STRATFORD, CONNECTICUT, August 20, 2015 - CTI Electronics Corporation is excited to announce ISO 9001:2008 certification which is a revalidation of an established 30 year Quality Management System that incorporates the best of the best practices. CTI's advanced stage gate processes incorporate the commercial ISO-9000, as well as conforming to military MIL-I-45208 and medical IEC 60601-1 to provide customers with a consistent high quality product. The TUV Rheinland and CONNSTEP auditors were impressed with the CTI Quality Management System. NEMA 4 (IP66) Medical Joysticks that can be easily disinfected or sterilized to combat pathogen transmission. CTI’ new Medical Joysticks have an impermeable molecular barrier protection against bio-hazardous agents. Original Equipment Manufacturers (OEMs) of medical devices now have an operator control device that will increase healthcare worker safety and reduce financial costs. STRATFORD, CONNECTICUT, June 19, 2015 - CTI Electronics announces a new line of parylene coated Medical Joysticks that withstand repeated hygienic cleaning, disinfection, or sterilization. These Medical Joysticks are designed with the purpose of reducing the spread of infectious diseases to humans within medical facilities. Its goal is a healthier and safer environment for clinicians and its patients. The Medical Joystick is offered to OEMs as an open frame component to be integrated into a medical device. 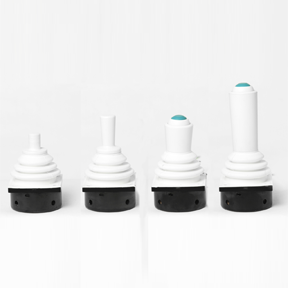 When installed, the Medical Joystick ensures a NEMA 4 (IP66) watertight sealing rating. Communication interfaces include voltage signal for motion control or digital signal acting as either a USB Medical Mouse or USB Game Control device for Software Application Developers. Device control across extended distances is implemented via RS-232, RS-422, or RS-485 signaling. Parylene coating of the joystick knob, boot, and elastomer switchpad ensures the toughest molecular barrier protection. The Medical Joystick is designed for long-term durability, 10+ million cycles, 100,000+ hours, an expected 10+ year life of reliable service and worry free maintenance. CTI’ Medical Joysticks are compliant with international regulations and standards including IEC 60601-1, CE, RoHS, and REACH. The molecular barrier protection of CTI’ Medical Joysticks are a superior solution for OEMs of medical and cleanroom equipment. Ideally suited for medical and care giving facilities such as hospital emergency rooms, surgical operating rooms, intensive care units, dental offices, and assisted living centers. Additionally, cleanroom environments such as semiconductor, biotechnology, and pharmaceutical laboratories, as well as food processing and aerospace manufacturing facilities will benefit. CTI Electronics Corporation is in the “crosshairs” of UxV manufactures for NextGen Command and Control. 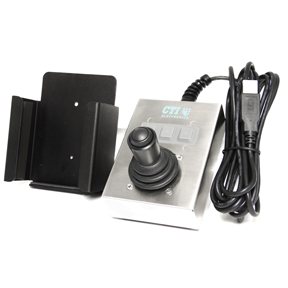 CTI’ NEMA 4X (IP66) uHMI-Pod™ Universal Industrial Joystick Controller is a groundbreaking solution for fixed and portable air, ground, or surface control stations. It embodies NextGen features using a new innovative encasing design, that’s hardened and protected, while enveloping world class electronics technology. STRATFORD, CONNECTICUT, April 10, 2015 - CTI Electronics has just unveiled a rugged, interoperable, mission flexible, pilot/operator control module; i.e. uHMI-Pod™. Its focused on a future safe technology design with standards based interfaces, operating systems independence, and multi-platform adaptability. All while eyeing a commitment to high reliability under harsh environmental conditions and long term durability by engineering design with usage of the best quality materials. The watertight sealing of the uHMI-Pod™ allows usage outdoors in extreme temperature and climate conditions. Its ergonomic design is in a non-corrosive, powder coated aluminum enclosure with cushioned closed foam for operator comfort. Elastomer protection from solid or liquid debris including oils, chemicals, and solvents is achieved by a specially formulated polyurethane coating. Protective shielding against electromagnetic interference as well as radio frequency signals was also incorporated. The stainless steel crash bar protects the joystick and doubles as a convenient carrying handle. Optionally, the crash bar is replaced by a cable bar protector and the enclosure secured to a surface using the two stainless steel threaded inserts on the bottom plate. A key design feature of the uHMI-Pod™ is flexibility in functionality. 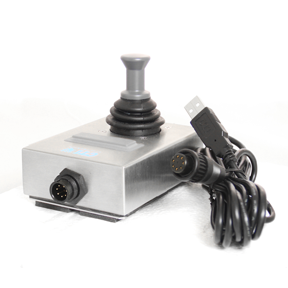 The joystick functions as a motion controller providing either absolute or relative positioning, with pin-point accuracy. Switch components that can be reconfigured and/or reprogrammed to meet system level control requirements. 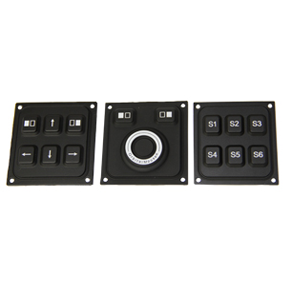 Four, six, eight, or 12 switch functions, hat-switch, mouse, or keypad functions are available. Plug-and-play mission capability allows fast connect/disconnect from a tethered, shielded, removable cable that provides assurance against communication interference, signal blockage or disruption. Standards based USB and RS422/RS485 interfaces allows for compliance with STANAG 4586 or SAE AS5684A. With the growing proliferation of UAVs, UGVs, USVs, and UUVs for military, commercial, and public sector applications, the uHMI-Pod™ modular design allows hundreds of possible combinations. Reusable from mission to mission the uHMI-Pod™ is adaptable; e.g. military operational missions, thwart detection and security protection, or surveillance of terrorist and/or criminal organizations. Its reliability is critical to first responders in law enforcement, firefighting, search and rescue, or humanitarian and disaster relief efforts, where early detection is crucial. Ruggedness and durability in the field is essential for inspections of roadways, bridges, power lines, gas pipelines, smoke stacks, building construction, or land surveys, GIS mapping, agriculture analysis, etc. Given the new FAA section 333 exemption, the applications for this robust versatile operator control module are now within a “visual line of sight”. CTI Electronics gets green light from U.S. Navy to manufacture a military grade industrial pointing device to retrofit its fleet of Cruisers and Destroyers. In cooperation with Lockheed Martin, CTI is producing a NEMA 4X (IP66) sealed hand held Industrial Mouse™ in a stainless steel enclosure with an aluminum cradle for secured storage. STRATFORD, CONNECTICUT, June 28, 2013 - CTI Electronics has been supplying rugged computer peripheral and motion control devices to U.S. armed forces for over 20 years. It's commitment to long term product availability is only part of the reason for the selection of the Industrial Mouse™ pointing device. The ability to meet military specification standards, ensure high reliability and durability, within a tight budget was essential. Sequestration may have reduced budgets but it doesn't mean sacrificing on quality products that the men and women of the U.S. armed forces deserve. The Industrial Mouse™ is a high precision joystick that allows computer cursor control in harsh environments. It prevents liquid or debris ingress, operates in extreme temperature ranges, and protects against electromagnetic interference as well as radio frequency signals. The selected M20U9-N3 pointing device has a standard USB connection with three mouse buttons on the enclosure and a left mouse button on the joystick. The key design feature that solidified the selection of this hand held pointing device was its ease of use. 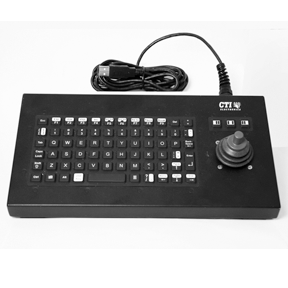 The Industrial Mouse™ provided precision control of the mouse cursor with an instantaneous point-n-click button on the joystick. Speed and accuracy were paramount in the selection process by the military crew members. Secure and convenient storage of the pointing device was also a critical factor onboard the vessel. The aluminum cradle is mounted to a non-movable surface which securely holds the hand held pointing device with padded rubber gaskets. The design provides the operator with the freedom of usage either in or out of the cradle based upon the conditions at sea. Along with several industrial pointing device choices, CTI offers a number of manufacturing options to tailor a device to the requirements of the application. The modular design allows sub-assemblies to be interchanged; producing hundreds of possible combinations, while still maintaining a rapid order to delivery process. For those Original Equipment Manufacturers and Systems Integrators that require a custom human machine interface device, CTI's engineering and fabrication expertise can be contracted. Industrial peripherals – joysticks, mouse pointers and keyboards that serve as the interface between man and processing equipment – are under constant assault in harsh, messy industrial environments. In processing plants, mines, mills and manufacturing environments across the country, these peripherals are exposed to extreme high and low temperatures, moisture, high pressure wash downs, dirt, grime and operator abuse often around the clock. Unfortunately, many of the so-called "industrial" peripherals that claim to be built to last in these environments often fail or malfunction within months and need to be replaced or repaired at considerable ongoing cost. Hand Held HID-Compliant Motion Controllers for Rugged Applications! STRATFORD, CONNECTICUT, October 4, 2012 - CTI Electronics expands its line of world class industrial motion controllers with the M20UxT-Nx-7P Series. It’s designed for interoperability with Windows® Operating System, Mac OS X®, or Linux OS using a standard USB HID-Compliant communication protocol. This industrial motion controller has a NEMA 4X (IP66) water tight disconnect USB cable that is easily removable if damaged in a rugged indoor/outdoor application. The molded USB cable is durable, high impact resistant, and shielded to protect against EMI/RFI signals. The plug-n-play hand-held M20UxT-Nx-7P Series USB motion controller is offered in a stain resistant stainless steel enclosure (4.21" x 3.06" x 1.53"). It’s designed for many years of service and comes with a one (1) year warranty and five (5) year repair policy. Military, Marine, Industrial, and Aerospace applications will benefit from the ten (10) joystick knobs with single, dual or three axes of control plus three to five buttons of additional control functionality. It’s USB HID-Compliant communication protocol allows the Software Application Developer to access the absolute position of the joystick and switch logic levels through the standard USB HID Driver application programming interface. This is a future safe investment against computer hardware or operating system upgrades. The 10 foot USB cable has a NEMA 4 (IP66) plug protecting against liquid or solid debris contaminants and allows for quick disconnect, cleaning, and storage of the cable. Long-term durability, 10+ million cycles, of these motion controllers is achieved with the use of hard gold plated contacts for the industrial switches and a non-contacting inductive joystick which guarantees "no drifting". The switches’ molded silicone rubber is Syn-Proof™ coated to protect against harsh chemicals, bacteria, and synthetic oils. Thus, lowering overall maintenance costs and increasing the return on investment. Typical usage includes Aviation Aircraft Flight Control Vehicles, Flight Simulators, Marine Underwater Unmanned Vehicles, Pan-Tilt-Zoom Camera Systems, Robotic Manufacturing Equipment, Land Mobile Surveillance Vehicles, etc. In addition, CTI also offers an anodized aluminum M2000 holder for convenient placement and storage of the M20UxT-Nx-7P series Motion Controller. The aluminum holder has pre-drilled holes for simple screw mounting alongside any machine, panel, or cabinet. Illuminated Industrial Keyboard for Mobile Applications! STRATFORD, CONNECTICUT, October 4, 2011 - CTI Electronics expands its new line of rugged industrial keyboards with the KIF6000-Bx Backlit Series. Recently introduced in July 2011, this line of compact illuminated keyboards includes the original Industrial Mouse™ pointer. This world class industrial grade keyboard provides a water tight NEMA 4 (IP66) sealing and is specifically designed for mobile applications. 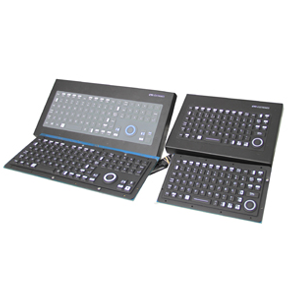 These keyboards offer a small footprint, 101/104 key functionality, and a high precision pointing device, all with protection against vibration and/or EMI/RFI signals. US English (QWERTY) is standard, others legends such as French (AZERTY), Spanish (QWERTY), German (QWERTZ), Italian (QWERTY), or Portuguese (QWERTY) are available upon request. These high impact resistant industrial keyboards come with a five (5) year repair policy. Thereby, lowering overall maintenance costs and immediately affecting the return on investment. The Plug-N-Play KIF6000-Bx Series (6.13" x 11.27" x 1.16") backlit keyboard is offered in an aluminum or stainless steel enclosure. Military, Marine, Medical, and Aerospace applications will benefit from the ten (10) levels of illumination as environmental lighting conditions change. The same rugged durability is available with the non-backlit Plug-N-Play KIF6000 Series keyboard. Both Series come standard with a USB cable or an optional bulkhead panel cable allowing the convenience of a quick disconnect NEMA 4 (IP66) plug for usage in areas of liquids or solid debris contaminants. The watertight rugged enclosures offer two stainless steel threaded inserts on the bottom for easy mounting onto a panel, a console, or into a 2U rackmount drawer. Long-term durability, 10+ million cycles, of these keyboards is achieved with the use of hard gold plated terminals/contacts. Its molded silicone rubber is Syn-Proof™ coated to protect against harsh chemicals, bacteria, or synthetic oils. The 2 mm travel of the keys offer excellent tactile feel. USB interface is compatible with standard computer hardware and operating systems, and no special driver or calibration is required. And the Industrial Mouse™ guarantees "no drift" for the life of the keyboard. Typical usage includes Aviation Aircraft Control Systems, On-Road Transportation Vehicles, Mobile Military Equipment, Off-Road Heavy Equipment, Medical Nursing Stations, Marine Vessel Control Panels, Railroad Command Systems, etc. STRATFORD, CONNECTICUT, October 4, 2012 - CTI Electronics expands its line of world class industrial motion controllers with the M20UxT-Nx-7P Series. It's designed for interoperability with Windows® Operating System, Mac OS X®, or Linux OS using a standard USB HID-Compliant communication protocol. This industrial motion controller has a NEMA 4X (IP66) water tight disconnect USB cable that is easily removable if damaged in a rugged indoor/outdoor application. The molded USB cable is durable, high impact resistant, and shielded to protect against EMI/RFI signals. The plug-n-play hand-held M20UxT-Nx-7P Series USB motion controller is offered in a stain resistant stainless steel enclosure (4.21" x 3.06" x 1.53"). It's designed for many years of service and comes with a one (1) year warranty and five (5) year repair policy. Military, Marine, Industrial, and Aerospace applications will benefit from the ten (10) joystick knobs with single, dual or three axes of control plus three to five buttons of additional control functionality. 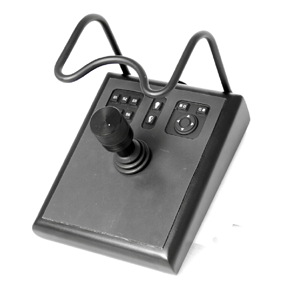 It's USB HID-Compliant communication protocol allows the Software Application Developer to access the absolute position of the joystick and switch logic levels through the standard USB HID Driver application programming interface. This is a future safe investment against computer hardware or operating system upgrades. The 10 foot USB cable has a NEMA 4 (IP66) plug protecting against liquid or solid debris contaminants and allows for quick disconnect, cleaning, and storage of the cable. Long-term durability, 10+ million cycles, of these motion controllers is achieved with the use of hard gold plated contacts for the industrial switches and a non-contacting inductive joystick which guarantees "no drifting". The switches' molded silicone rubber is Syn-Proof™ coated to protect against harsh chemicals, bacteria, and synthetic oils. Thus, lowering overall maintenance costs and increasing the return on investment. Compact Rugged Industrial Keyboard for Mobile Applications! 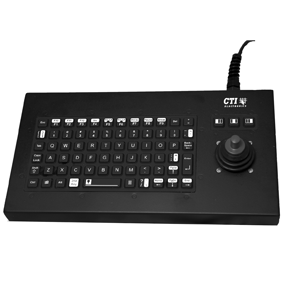 STRATFORD, CONNECTICUT, July 1, 2011 - CTI Electronics offers the KIF6000 Series, a new line of rugged industrial keyboards with the original Industrial Mouse™. These world class NEMA 4 (IP66) industrial keyboards were specifically designed for mobile applications requiring a small footprint, 101/104 key functionality, and a high precision pointing device that is immune to vibration and/or EMI/RFI signals. Legends include US English (QWERTY), French (AZERTY); others are available upon request. Off Road, On Road Transportation Vehicles will reduce budgets and maintenance costs by utilizing this high impact resistance industrial keyboard series. The Plug-N-Play KIF6000 Series (6.13" x 11.27" x 1.16") non-backlit keyboard is offered in aluminum or stainless steel enclosure. Military, Marine, and Aerospace applications can use the Plug-N-Play KIF6000-Bx Series� with an illuminated keyboard. Both Series come standard with a USB cable or an optional bulkhead panel cable allowing the convenience of a quick disconnect or usage in areas of liquids or solid debris contaminants. The watertight rugged enclosures offer two stainless steel threaded inserts on the bottom for easy mounting onto a panel, a console, or 2U rackmount. Usage includes Aviation Aircraft Control Systems, On-Road Transportation Vehicles, Mobile Military Equipment, Off-Road Heavy Equipment, Medical Nursing Stations, Marine Vessel Control Panels, Railroad Command Systems, etc. OEMs, S.I. 's, Going Global? Use an Industrial Keyboard with a country specific language! STRATFORD, CONNECTICUT, February 14, 2011 - CTI Electronics enables its line of rugged industrial KIO6000 and KIO7000 keyboards with country specific languages. These NEMA 4 (IP66) industrial keyboards include an integrated mouse (OrbitalMouse®). Languages available include US English (QWERTY), Spanish (QWERTY), German (QWERTZ), French (AZERTY), Portuguese(QWERTY), UK English (QWERTY), and Italian (QWERTY); other languages are available upon request. Original Equipment Manufacturers will reduce design costs by standardizing on one of two industrial keyboard series. The OEM KIO6800 Series (4.46" x 8.00" x 0.51") has a patented imbedded numeric keypad in the non-backlit offering or a fully backlit offering. Or, the OEM KIO7800 Series (4.456" x 11.625" x 0.53") which offers a numeric keypad in both the illuminated and non-illuminated models. Both Series offer 8 levels of cursor speed adjustment and 10 levels of illumination (LED backlit models). Systems Integrators will offer faster time to market products with an industrial keyboard having the same look and feel, yet a different language. Those products can easily be packaged with a Portuguese industrial keyboard that's going to Brazil or a German industrial keyboard headed to Germany, and yet another Spanish industrial keyboard shipping to Spain. The Plug-n-Play KIO6000 Series (6.13" x 8.70" x 1.33") or KIO7000 Series (6.13" x 12.33" x 1.32") are offered in a watertight rugged enclosure, aluminum or stainless steel. Long-term durability, 10+ million cycles, of these keyboards is achieved with the use of hard gold plated terminals/contacts. Its molded silicone rubber is Syn-Proof™ coated to protect against harsh chemicals, bacteria, or synthetic oils. The 2 mm travel of the keys offer excellent tactile feel. PS/2 and USB interfaces are compatible with standard computer hardware and operating systems, and no special drivers or calibration is required. And the OrbitalMouse® guarantees "no drift" for the life of the keyboard. Innovative design allows for quick interchangeability with the reliability of a world class industrial keyboard. Open new doors to international sales opportunities utilizing CTI's rapid prototyping capability and fast time-to-market delivery. Usage includes Unmanned Aerial Vehicle Control Systems, On-Road Transportation Vehicles, Rugged Military Laptops, Off-Road Heavy Equipment, Outdoor Test Equipment, Medical Operating Rooms, CNC Machines, Marine Vessel Control Panels, Scientific Laboratories, Medical Nursing Stations, Military Systems, Food Processing Stations, Pharmacies, etc. STRATFORD, CONNECTICUT, January 10, 2011 - CTI Electronics compliments its line of rugged industrial pointing devices with a Switch Function Control device. These three devices have similar form, the exact same cutout fit of 1.50” x 1.62”, but offer different functionality. 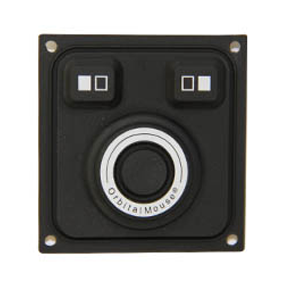 Two offer Mouse Cursor control and the third offers Switch Function control. These are the most compact yet ergonomically usable devices today. All have the Syn-Proof™ coated elastomer which protects against harsh chemicals and synthetic oils. And, the NEMA 4 (IP66) watertight seal prevents ingress of liquids and solids. Six Button Function Switchpad – when combined with an Intelligent Serial or USB Interface PCB can be programmed to provide six individual function codes to the host computer. Illumination is an option with either constant or toggled backlighting, or no backlight. The key design feature of using these devices is the interchangeability of positioning for either operator convenience or application usage. And, the key implementation feature is that added switch functions can be easily daisy-chained. Examples of usage include Off-Road Vehicles, On-Road Vehicles, Outdoor Test Equipment, Automation Machines, Marine Vessel Control Panels, Medical Device Instrumentation, Scientific Measuring Instruments, Medical Ultrasound Equipment, Military Weapon Systems, Utility and Energy Plant Console Panels, etc. STRATFORD, CONNECTICUT, October 20, 2010 - CTI Electronics expands its line of rugged industrial pointing devices by introducing the compact NEMA 4 (IP 66) OrbitalMouse® cursor, the OM20U2 Model. The unique patented design of the OM2000 Series family offers high reliability, drift-free performance, ruggedness and excellent tactile feel. Users experience a fast moving pointer with a light touch of the finger, obsolescing those force pressure sensitive devices that eventually breakdown. Factory settings give OEM’s eight (8) mouse speed curves with backlighting as an option. The low profile button style pointer, 0.2 inch above and 0.3 inch below panel, a size of 1.93 by 1.83 inches makes it the perfect solution for limited space situations such as instrumentation equipment, outdoor monitoring or surveillance equipment, handheld mobile devices, etc. Left and right mouse buttons are easily operated with the same one finger operation. Designed for Commercial, Industrial, Medical, Aerospace, or Military instrumentation applications, the new OrbitalMouse® superior NEMA 4 (IP 66) environmental sealing eliminates moisture and dirt contaminants, protects against harsh chemicals, oils, solvents, and requires no maintenance. It can be exposed to extreme temperature ranges, high humidity, precipitation, and debris. Available with a standard USB interface, no special drivers or calibration is required. 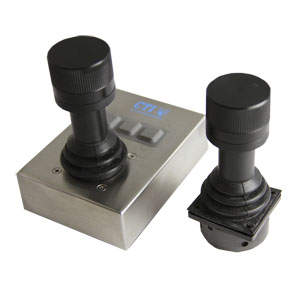 STRATFORD, CONNECTICUT, September 10, 2010 - CTI Electronics continues to expand its line of rugged field-proven F-Series industrial joysticks by introducing the world’s first inductive NEMA 4 (IP 66) 3-Axes of motion joystick today. Based on the same patented non-contacting design, of the F-Series family, this joystick provides high reliability, drift-free performance, ruggedness and excellent tactile feel. The smooth travel and exact precision control, with a 3.2 inch above panel handle, make it the perfect solution for demanding situations including exposure to extreme temperature ranges, high humidity, precipitation, and debris. Designed for Industrial, Medical, Aerospace, or Military-grade applications, the new 3-Axis Joystick superior NEMA 4 (IP 66) environmental sealing eliminates moisture and dirt contaminants, provides either analog or digital output, and will function as a USB Joystick’ (Flight Stick technology), an Industrial Mouse™, or a Motion Controller Man Machine Interface.